MPF allows you to use a FadeCandy LED controller to drive the LEDs in your pinball machine. A FadeCandy is a small, cheap ($25) USB controller which can drive up to 512 serially-controlled RGB LEDs. 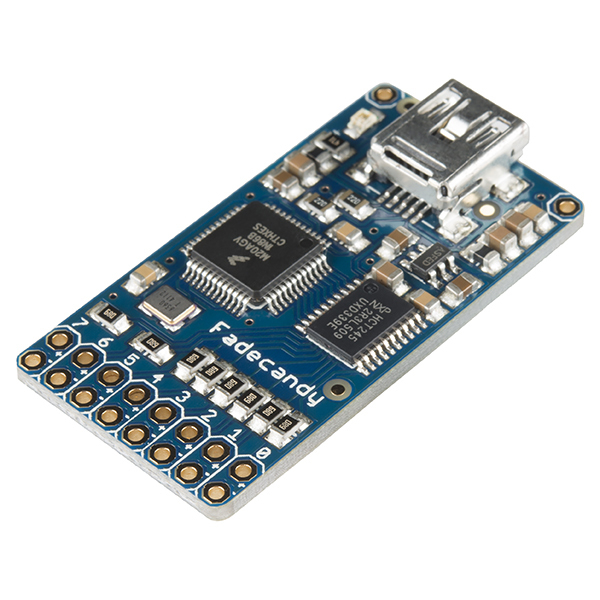 You can read more about the FadeCandy on the main page of the FadeCandy software repository in GitHub or on Adafruit or SparkFun, where you can buy one for $25. The FadeCandy is very advanced, offering advanced light processing capabilities such as dithering and interpolation that are not available if you just control LEDs directly. The FadeCandy hardware is driven a FadeCandy server software that you’ll run on your host computer along side the MPF game engine and the MPF media controller. The FadeCandy server talks to the FadeCandy hardware via a USB driver. The FadeCandy server receives instructions for LEDs connected to the FadeCandy via a protocol called Open Pixel Control (OPC). Putting it all together, MPF talks to the FadeCandy server via OPC, and the FadeCandy server talks to the FadeCandy hardware via USB. The first step is to download the FadeCandy package from GitHub. You can unzip it to wherever you want. In my case, I googled and found this procedure to build custom .inf files for Windows. It seems crazy but it wasn’t too bad. I had to build two: One for the FadeCandy device and one for the FadeCandy boot loader. Either way, you can follow the docs and the forums around the FadeCandy and get it setup. The FadeCandy download package includes pre-built binaries for Mac and Windows. On Linux you can compile it. Again, the FadeCandy documentation has details about how to do this. At this point you should be able to run the fcserver and to talk to your FadeCandy LEDs and get them to do things. There are a bunch of sample apps in the FadeCandy package that are kind of cool. Next you need to configure your LEDs in MPF to use the fadecandy platform. By default, all types of devices are assumed to be using the same platform that you have set in the hardware: of your machine config file. So if your platform is set to fast, MPF assumes your LEDs are connected to a FAST controller, and if your platform is set to p_roc or p3_roc, MPF assumes your LEDs are connected to a PD-LED board. The FadeCandy hardware has 8 connectors for LEDs, each of which can support up to 64 RGB LEDs (for 512 RGB LEDs total). The connectors are numbered 0-7. The individual LED numbers are sequential across channels. The first LED on Connector 0is #0, the second is #1, etc., up #63 on Connector 0. Then Connector 1 picks up where Connector 0 leaves off, with the first LED on Connector 2 being #64, and so on. The FadeCandy doesn’t actually know how many LEDs are connected to each connector, so the first LED on Connector 1 is always LED #64 even if you have less than 64 LEDs physically connected to Connector 0. Since MPF can support up to four FadeCandy boards, valid board numbers are 0-3. If you do add more than one FadeCandy board, see the FadeCandy documentation for instructions on how to configure the additional FadeCandy boards for the addresses with higher than 0. In order for MPF to communicate with the FadeCandy, the fcserver has to be running. Refer to the FadeCandy documentation for instructions for this. On Windows, for example, it’s just called fcserver.exe. There are several command line options you can use with the server, though you don’t need any of them with MPF unless you have more than one FadeCandy board connected. The FadeCandy hardware supports some advanced options which are configured in the fadecandy: section of your machine configuration file. Specifically, you can set the keyframe interpolation, dithering, gamma, white point, linear slope, and linear cutoff. The defaults should be fine for almost everyone, though you can go nuts if you want. If you are using RGB LEDs, they might not be perfectly white when you turn them on. They might be pinkish or blueish instead depending on the brand of the LED. To a certain extend this is normal/expected and you can compensate for it by configuring hardware color correction in the fadecandy. If you need more than one correction profile (e.g. for multiple LED models) you need to fall back to software color_correction profiles in light_settings. Hardware correction should be preferred and give you much more dynamic range.